2019 kidding season has began. If you would like to see what pairings are due when, click on the more section and look under Breeding Schedule. We will be selling most kids and some does in milk will be available as well. If you have any questions please call or email. Come join us for updates on kiddings, show wins or just fun farm stuff. The herd tested Negative for Johnes and CAE on 12/18/17. Updated: 4/18/19 We have kids for sale. Please email for current list. They are arriving daily. 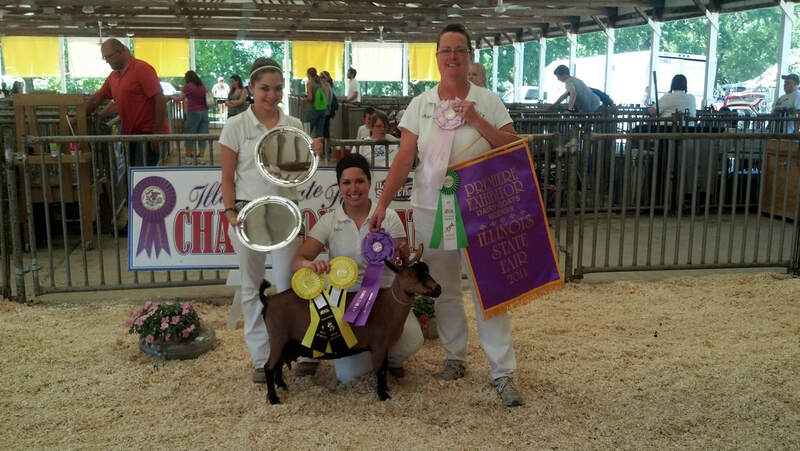 Two Dogs Farm Maci winning GCH Senior Doe at the IL State Fair. Our family farm consists of 400 acres of corn, soybeans, Black Angus cattle and Registered Show Quality Nigerian Dwarf dairy goats for both milk production and showing. We are located in Smithshire, Illinois in the heart of the Midwest. We are twenty miles from the Mississippi River and Iowa. Two Dogs Farms is home to a menagerie of animals. We raise and sell registered Nigerian Dwarf dairy goats for showing, 4-H and youth projects. All of our goats are registered with the Nigerian Dairy Goat Association (NDGA), American Goat Society (AGS) and the American Dairy Goat Association (ADGA). We are also members with all three of the registries and I am a licensed judge for NDGA. Our daughters Emilie, Adelaide and I also started the Land of Lincoln Nigerian Dwarf Goat Club to help put on workshops and shows. As you can see we are devoted to our goats and helping others learn more about them. We have been raising Nigerian Dwarfs for seventeen years and enjoy showing, cheese making and introducing others to the excellent qualities of the Nigerian Dwarf breed. To learn more about the breed go to www.ndga.org or feel free to contact us at 319-572-4105 or email aalecock@yahoo.com.